At some point, every parent is asked why the sky is blue. A good way to explain this to a five year old is to ask them what colors make up white light, in case you forgot its the rainbow. Remind them the colors of the rainbow (red, orange, yellow, green, blue, indigo, and violet). Then explain that the air we breathe actually changes the way light moves. This is because air is made up of molecules that the light hits and changes the light’s direction. Finally, you can simply explain that the inner part of the rainbow (blue, indigo, and violet) move through the air the best to reach our eyes, giving the sky its blue color. For the kid that keeps asking, “why” you can give them the simple answer to this question: an effect known as Rayleigh Scattering caused by small molecules in the atmosphere is what gives the sky it’s blue color. Rayleigh scattering causes shorter wavelengths to be scattered a lot more (1/wavelength^4). Remember the colors of the rainbow from longest wavelength to shortest wavelength are red, orange, yellow, green, blue, indigo, and violet. Blue being a shorter wavelength means blue light dominates the scattered light coming from the sky. A tricky question a kid could ask is, “why the sky isn’t violet?” This is a great question. Violet is the shortest wavelength of light we can see, so if shorter wavelengths are preferentially scattered, why isn’t the sky violet? The answer to this question is actually really cool and makes light really fun to study! To fully explain to your (hypothetical?) child why the sky isn’t violet, first you should talk a bit more about how light scatters. The two most common ways that light scatters are Mie Scattering and Rayleigh Scattering. Mie’s solution to the scattering of light allows us to model the movement of light as it interacts with particles, like dust and water, that are similar size or larger than the wavelength. With Mie scattering, light is mostly scattered along the direction it originally hit the particle, and the effect is not wavelength dependent. Rayleigh scattering, as we have already mentioned, is what gives the sky its blue color. Rayleigh scattering occurs when light interacts with particles much smaller than the wavelength size. Light that undergoes Rayleigh scattering is equally scattered in every direction. Rayleigh scattering is exponentially stronger with shorter wavelengths, meaning short blue, indigo, violet end of the spectrum is much more strongly scattered than the red, yellow, green end of the spectrum. Now that your (again, hypothetical ) kid knows how light scatters, you can help them begin to build an understanding of why the sky is blue. Light that is Mie scattered will mostly continue moving in the direction it was moving. So if you let your kid look at the sun (a terrible idea), they will see the effects of Mie scattering (especially if there are clouds in the way). However, if you kid looks at the rest of the sky, light that has been Mie scattered is going to keep moving away from their eyes. So overhead, Rayleigh scattering is dominant, giving the sky its blue color. Up to this point you have only really explained to your kid the short answer for why is the sky blue. The second part of this answer relies on a the second way that light can interact with matter, absorption. I have previously talked a little about the absorption of light when I tried to figure out how to attach a laser to a shark. Here though, I am going to focus on how our bodies use the absorption of light to help us perceive the world around us. The eyes of most people detect light via rods and cones. Rods and cones absorb light and convert the energy absorbed into a signal sent to your brain. Rods are responsible for non-color specific and night vision, whereas cones provide you with your perception of color. Most people have 3 types of cones in their eyes, one for the detection of shorter wavelengths, violet to blue, one for the perception of longer wavelengths, orange and red, and one for the perception of the middle wavelengths, green and yellow. Now, what colors make up white light? There are two answers to this question the first is shown on the album cover to Pink Floyd’s dark side of the moon. As we pointed out at the start, white light is made up of all of the colors of the rainbow. The second answer to this question is more familiar to anyone who works with colors on a computer. We can simulate white light with simply an even combination of red, green, and blue. In fact, we can actually simulate most colors by manipulating combinations of red, green, and blue. So now we can get back to the question at hand, why is the sky blue? While Rayleigh scattering does preferentially scatter violet light over blue light, our eyes are far more sensitive to blue light. Additionally, Rayleigh scattering is occurring in the sky for all wavelengths of visible light, shorter wavelengths are merely scattered more. In fact what we are seeing as the color blue is really our eyes average out all of the wavelengths present in the sky and creating the perception of blue light. Now that your inquisitive (possibly hypothetical) child has likely completely lost interest you can explain that all color is merely how our eyes perceive the world. This is why individuals who are colorblind may not realize it until much later in life. Then you can go show them other cool optical illusions that are so good are fooling us. As an evolutionary biologist, it’s often a fun exercise to look at fictional creatures and think about how they might have evolved or how patterns in nature might apply to them. Ever since he became a playable in character in Mario Kart for SNES, I have always jumped at the chance to play as the King of the Koopas, Bowser–yes, even in Smash Bros where he’s a lower tier fighter. Video games aside, the lore around Koopas is sparse (or least from my knowledge), which leads to some great biological questions about how they function and survive. In particular, how do they reproduce and what mating systems might they have? In this post, I’ll set up some of the species boundaries of Koopas and in successive posts I’ll try to tackle some of the more interesting thought experiments. First, we need to establish what creatures are Koopas. The classic concept of species is the Biological Species Concept, the idea that if populations can interbreed and yield fertile offspring, they are the same species (e.g. horses and donkeys can make a mule, but the mule is sterile–thus horse and donkey are separate species). This is a useful start point as it might help us demarcate what are and aren’t Koopas. In order to test the Biological Species Concept we need to know if interbreeding occurs. This is a dark-corners-of-the-internet thing, so I’ll just assume if a romance is present between characters then the result of a pairing would be fertile offspring. So a quick look at some known pedigrees in the Mario world and it looks like Koopas are pretty consistent in their appearance. Bowser had his 7 children for the early games (later retconned to be his minions, but some guide books still state they are his children), and one other child, Bowser Jr., who appeared in Mario Sunshine. We also have Koops who is the son of Koopley, and Kolorado who had an unnamed father in Paper Mario. Clearly Koopas beget Koopas. But what about other denizens of the Mushroom Kingdom? Hammer Bros, Lakitus, and Boom Boom also have turtle-like appearances, so we’ll assume there isn’t any cryptic speciation (i.e., two different species that look similar) going on. It is also stated that Koopas evolved from Shellcreepers on the Mario Wikia. Shellcreepers still occasionally appear and certainly Bowser is as old as Shellcreepers, so they cannot be the ancestor to all Koopas. To be more accurate (although one can only do so much in a video game universe), I’m going to say Shellcreepers share a lineage with the other Koopas but are the most ancestral in form. Yoshis are from Dinosaur Land, which Bowser invaded, so they are geographically separate from Koopas. The only romantic entanglement we get from Yoshi is Birdo and neither are have the turtle-like appearance, so it seems unlikely Yoshi is a kind of Koopa. There is a strange thing to consider though; while not cannon, the Mario Bros live action movie suggests that most inhabitants are related despite their drastically different appearances (I would lose so much time nitpicking its evolution statements–so I’ll ignore them). It also shows Princess Daisy as being hatched from an egg–implying the human-like characters might be reptile-like as are the Koopas. We know Bowser is infatuated with Princess Peach, and his claim that Bowser Jr. was her son was believed, though not true. The fact that such a lie wasn’t immediately rejected suggests some plausibility. So it may be that the human-looking characters of the Mushroom Kingdom are also Koopas. We can already see an issue with the Biological Species Concept. Are the princesses and Toads actually Koopas? What about Mario and Luigi? They’re from a different land and stated to be human, but have romantic interests in the two princesses. Clearly defining species is an interesting challenge in evolutionary biology. There are many ways to define a species in biology, though Biological is often a good start point for determining speciation in most sexually reproducing species. Scientists are uncovering more and more that hybridizations occur across lineages that are distinct enough to be considered separate species without sterilizing the offspring. In fact, humans have interbred with Neanderthals in the past despite the two being considered separate species. Evidence of this lies in sections of human genomes where parts of the sequence more closely match Neanderthal than the more ancient African lineage. Thus, those who can trace their ancestry to regions where Neanderthals co-occurred with humans have ~3-5% of their DNA inherited from Neanderthals. So even though it is hinted at the intermingling of the human-like members of Mushroom Kingdom and Koopas, it is still possible to consider them different species; therefore, given the drastically different morphologies and their reluctance to even cohabitate, I will treat the human-looking members of the Mushroom Kingdom as a separate species, but one capable of interbreeding with Koopas. Most people are familiar with the idea of a werewolf, a human with the ability to shapeshift into a wolf or humanoid wolf monster.There are many variations of the concept of a werewolf, but most versions center around the notion that the full moon acts as the catalyst for the transformation. Completely ignoring the fact that such a transformation would require a rapid reorganization of several body systems, the time has come to ask the hard question: Are there any unique properties of a full moon that could cause such a transformation? Does the full moon possess any unique qualities that could trigger the transformation from human to wolf? In many descriptions of werewolves, lycanthropy is a curse passed down by the bite of another werewolf. This curse may be some form of virus, similar to rabies, but I will leave that discussion to those more suited towards it. As a general note, some stories involving werewolves treat the transformation as a timed process that occurs with the cycle of the moon, regardless of the presence of moonlight. Timed processes such as this are called lunar rhythms. Lunar rhythms are really neat, but this blog post will focus more on the moon and moonlight itself. Most stories of werewolves involve the transformation typically only occurs at night during a full moon. The fact that the transformation only occurs at night is very important as full moons are often visible in the daylight. In fact some months, the full moon occurs entirely during the day. This tells us one of two things 1) it is not the shape of the moon that is triggering the transformation or 2) bright sunlight acts as an inhibitor to the transformation process. Furthermore, many accounts of the transformation describe the individual only changing after being bathed in moonlight, and not requiring the individual to look at the moon. This observation further supports the idea that the shape of the moon is not triggering the transformation process. Confirmation of the existence of a blind werewolf would be required to fully confirm this theory. However, finding such a specimen may prove challenging. This leads us to the idea that moonlight is what acts as the primary catalyst for the transformation. It is very possible for a virus to introduce an optically sensitive component to cells of the body. In fact there is a whole field of science, known as optogenetics, which allows scientists to introduce light-based control of muscle and nervous cells through genetic engineering. In that case, what is special about the light of a full moon? Well, during a single lunar cycle, lunar brightness increases exponentially as the moon waxes and decreases exponentially as the moon wanes. This means that during a lunar cycle, the full moon is the brightest. There are two big issues with the hypothesis of lunar brightness. The biggest issue is that if the transformation is caused by a brightness threshold alone, then a werewolf would transform anytime they walked out into the sunlight, as the moon is simply reflecting the light of the sun. This actually relates back to one of our observations earlier, bright sunlight may act as an inhibitor to the werewolf transformation. This would mean our virus is introducing some form of optically sensitive molecule that is activated at a certain threshold of light, but deactivated in some way by bright sunlight. Sunlight blocks the transformation of a person into a werewolf. This isn’t too far fetched as the sun is roughly 400,000 times brighter than the full moon. Alternatively, there could be some spectral shift of the light reflected by the moon relative to the sun that triggers the transformation. The moon isn’t a perfect reflector and does absorb some wavelengths more strongly than others. The reduction of one wavelength beneath a certain threshold may be the requirement for the transformation to occur instead. The second biggest issue is that the brightness of the full moon varies between lunar cycles depending on the angle between the moon and the earth, the distance between the moon and the earth, and the presence of small particles in the atmosphere. Interestingly, these changes are noteworthy because they do actually coincide with certain descriptions of werewolves. Some accounts of werewolves describe the potential for the change to occur on the days preceding and following a full moon. This could be due to the moon being closer to the earth (so that it takes up more of the sky) or at a point higher in the sky (so that it is traveling through less atmosphere). Furthermore, many accounts of werewolf encounters describe the transformation occurring as the moon appeared from behind the clouds. This is in agreement with the theory that a certain optical threshold must be reached to cause the werewolf transformation. In conclusion, we propose that lycanthropy is caused by the introduction of an a molecule that responds to light into the host’s cells. This molecule is activated by light above a certain intensity threshold and inhibited by the presence of bright sunlight. Thus, if werewolves are real and follow the rules discussed above any individual who has been bitten by a werewolf need only to wear a thick layer of sunscreen on the nights leading up to and following the full moon to prevent their transformation. My wife and I had a long debate on whether or not the werewolves in the Harry Potter books follow lunar rhythms. Through most of the books it is implied the transformation occurs whether or not the individual is exposed to moonlight during a full moon, thus implying a lunar rhythm. However, in the third book Lupin doesn’t transform until the moon comes out from behind a cloud and bathes the party in moonlight; implying moonlight is the catalyst for the transformation. So either the cloud moment is just meant as dramatic flair and he would have transformed at that exact moment either way (which could is probably true, but annoyingly coincidental) or the cloud moment is the answer and Lupin should never transform if he simply locked himself in a basement or dungeon. Either way we were definitely overthinking the whole situation. Figure 1. Light Microscope from the late 1800s. Photo credit: Reed Stubbendieck, Personal Collection. If I asked you what the signature tool of a microbiologist is, you would likely respond: the microscope (Fig. 1). Not only do the field and instrument share the prefix micro (from Greek mikrós, meaning “small”), but the development of microscopy established the field of microbiology. In the mid-seventeenth century, Robert Hooke and Antonie van Leeuwenhoek built the first microscopes. Using his microscope, Hooke provided the first description of a microorganism when he reported on the fruiting bodies of fungi and coined the term “cell” in reference to the structures that he observed in cork. Meanwhile, van Leeuwenhoek was the first individual to observe protozoa and bacteria, which he called “wee animalcules”. Born from the observations of Hooke and van Leeuwenhoek, generations of microscopists have used the microscope to study the structure and substructures of cells, observe proteins in motion, and diagnose diseases, among many more applications (Some of which I’m sure Scott will explore in future posts). Thus, since the inception of microbiology, it has been difficult to disentangle the field and the instrument. However, microbes are not confined to the micrometer scale and hidden beyond our eyesight. In this post, I would like to highlight some examples of microbes that you likely encounter in your daily life and are visible with your naked eye. Figure 2. Mushroom fruiting bodies. Photo taken in East-Central Texas by Reed Stubbendieck. Some of the most obvious examples of macroscopic microbes are fungi and include the beautiful mushrooms that bloom near the trunks of trees in our yards and forests (Fig. 2). But given that antibiotics are one of my primary research interests, I’d be remiss if I didn’t highlight the humble bread mold Penicillium. Who among us hasn’t kept a loaf of bread for a little too long, only to discover an unexpected fuzzy blue-green growth (Fig. 3A)? Likely, we write off the loss, toss the loaf, and head to the grocery store to acquire more bread. However, this contaminant is among the most important microbes ever discovered! In 1928, spores from this mold contaminated a Petri plate in Alexander Fleming’s laboratory and produced a region where bacteria were unable to grow (called a “zone of inhibition”) (Fig. 3B). Later on in 1940, Fleming’s observations inspired the chemists Ernst Chain, Howard Florey, and Norman Heatley to develop methods to mass produce the active agent from the mold. The result of their work was the antibiotic penicillin (Fig. 3C), which was likely the single most important advancement in modern medicine. Not a bad cost for a missed sandwich. Figure 3. The bread mold Penicillium produces antibiotics. (A) Moldy bread covered in Penicillium. Note: this is a stock photo and not a picture of my own bread (B) Penicillium inhibits the growth of the pathogen Staphylococcus aureus on Petri plates. (C) Core structure of penicillin. 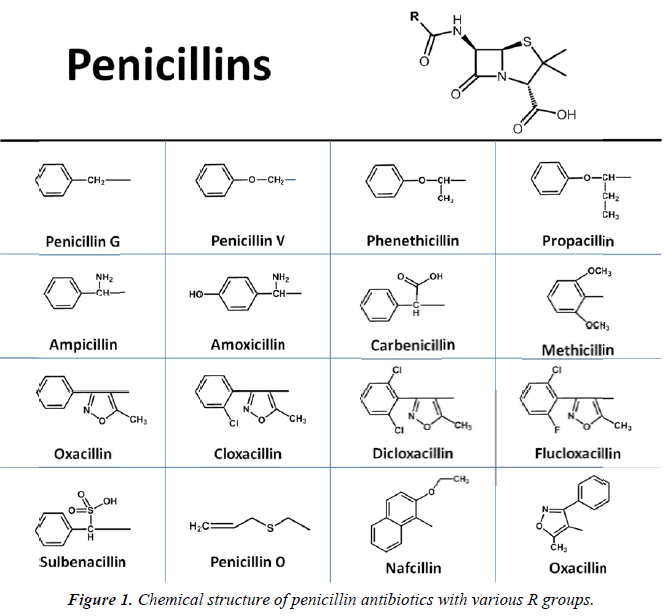 The R group is variable and distinguishes different types of penicillins. Photo credits: Panel A: Wikipedia user Henry Mühlpfordt under the GNU Free Documentation License, Version 1.2. Panel B: Christine L. Case, Ed.D. While antibiotics treat our infections, the yeast Saccharomyces cerevisiae helps feed the body and soul. To simplify an introductory course in biochemistry, when yeast consumes sugars but is starved for oxygen, it produces carbon dioxide gas and ethanol as byproducts of its metabolism. We use the former to make our bread rise and the latter to give our booze its buzz (Fig. 4A). But that’s not all, together the interactions of yeast and bacteria give sourdough bread its signature tangy acidic taste (Fig. 4B), form the biofilms that make up the rinds of cheese (Fig. 4C), and provide starters for Kombucha tea (Fig. 4D) (see here for more information). Figure 4. Fermented beverages and foods. (A) Homebrewed wheat beer in fermenter showing Krausen, the foamy head that consists of yeasts and wort protein, at the air-liquid interface. (B) Sourdough starter showing carbon dioxide bubbles after feeding. (C) The rinds of cheese wheels are a mixed bacterial and fungal biofilm. (D) Kombucha tea with pellicle at the air-liquid interface. Photo credits: Panels A and B: Reed Stubbendieck. Panel C: Wikipedia user Myrabella under a CC BY-SA 3.0 license. Panel D: Graciously provided by anonymous. Outside the kitchen, microbes also live together symbiotically and produce amazing structures. For example, the lichens that cover rocks, tree trunks (Fig. 5A) and gravestones (Fig. 5B) are made up of algae, cyanobacteria, ascomycete fungi, and even yeasts living together! Within nature, symbiosis is the name of the game. Figure 5. Lichens. (A) Lichen covering a tree trunk in Wisconsin. (B) Lichens growing on a gravestone. Photo credits: Panel A: Reed Stubbendieck. Panel B: Brian Robert Marshall under a CC BY-SA 2.0 license. One of my favorite symbiotic systems is studied by my current laboratory and involves fungus farming ants, the fungus they cultivate (called the cultivar), and a symbiotic bacteria called Pseudonocardia. These ants cut leaves and other plant material (depending on the ant species), but the ants do not eat the leaves. Instead, the ants feed the leaves to their fungal crop, which they consume it as their sole food source. Because the fungal cultivar is maintained asexually with limited opportunities for genetic recombination, it is not genetically diverse and is susceptible to pathogen infection. One pathogenic fungus is called Escovopsis and it is only found within the fungal gardens. The Escovopsis can overgrow and consume the fungal crop. To prevent this infection, the ants use grooming behaviors and form a symbiotic relationship with bacteria called Pseudonocardia, which produces antifungals that inhibit the growth of Escovopsis but are not harmful towards the fungal cultivar. The ants have evolved specialized structures to house and feed the Pseudonocardia on their exoskeletons and some ants, such as Acromyrmex sp. cf. octospinosus, can become totally covered by their symbiotic bacteria (Fig. 6)! Figure 6. Symbiosis between ants and bacteria. Acromyrmex sp. cf. octospinosus worker ant covered in white symbiotic bacteria. Note the chewed leaves in the fungal crop. Photo credits: Alex Wild, purchased for use on this website. Finally, should you find yourself in orbit over Earth, please find comfort in the knowledge that you can still revel in the beauty of our microbial world. Satellite photographs from NASA have captured images of massive blooms of algae in our planet’s oceans and seas! Figure 7. Algae bloom over the Barents Sea. This photograph showing a large algal bloom was taken by the NASA Aqua satellite in 2011. This post has barely covered the diversity of microbes in our world, but I hope it has convinced you to leave the microscope behind and look for examples of microbes in your daily life. Check your showers for the pink-colored Serratia marcescens, observe a lovely mushroom on your lawn, or overturn a rock and find a lichen. I would love for you to share your pictures with me! Use the hashtag #macromicrobiology and be sure to tag @bactereedia and @SciSidequests in your post. If you’re interested in checking out more beauty in the microbial world, I highly recommend the book Life at the Edge of Sight by Scott Chimileski and Roberto Kolter and the corresponding museum exhibit at the Harvard Museum of Natural History.